Marlins and Swordfish: What’s the Difference? 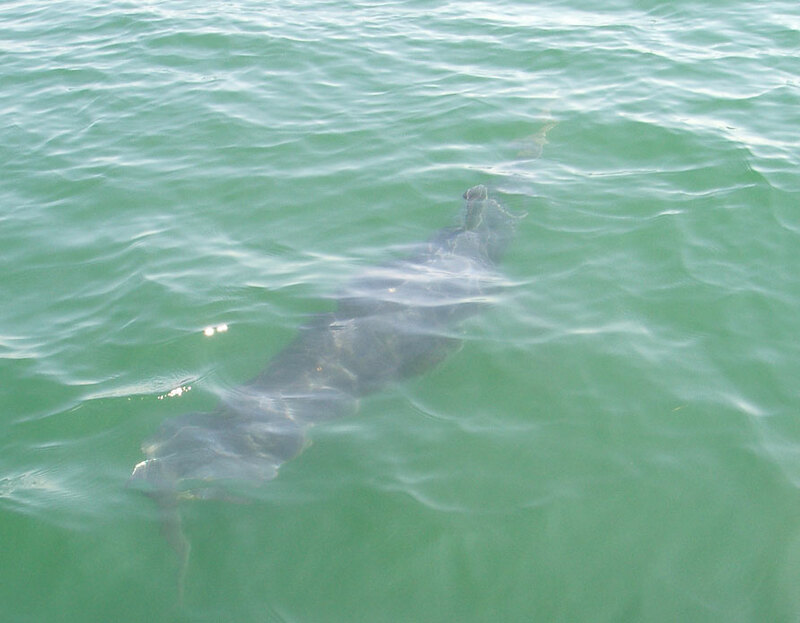 A two metre long Billfish swam by our boat one mile off shore, near Selsey, West Sussex. 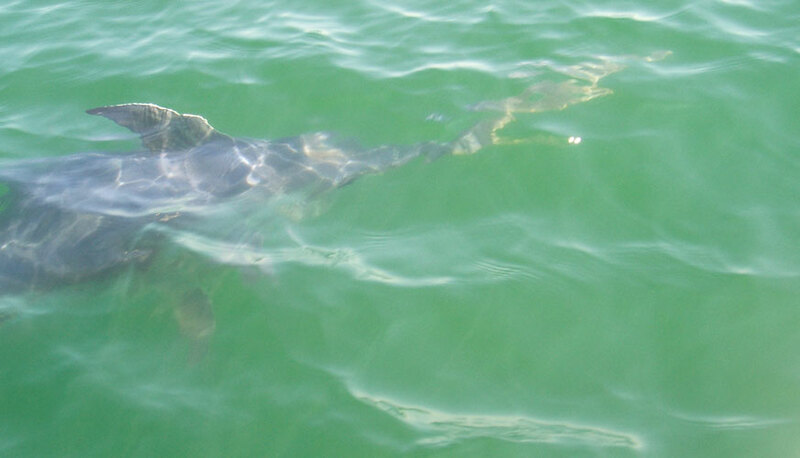 The shark like dorsal fin and long bill could be seen near the surface as it chased the lure under the boat. The consensus said its was a Swordfish, Xiphias gladius, and it looked like one to me. "Chris Wheeler and I were Plaice fishing, one mile off shore, near Selsey. We're drifting when Chris spots something at the stern of the boat. It's a large creature, maybe 5 or 6 feet long. Instinctively I put a cast in with insanely inappropriate tackle and attempt to draw the fish in. Astonishingly the fish turns on my tiny lure and lights up like a Christmas tree! As it follows the lure at speed, towards me on the bow, we can now clearly see it's a Billfish, and a beautiful one at that. I will never forget the electric blue back as it glides under me. We lose sight of the fish and both of us are left shaking with excitement, raised further when we realise that Chris has cleverly managed to capture the fish on video." Another Atlantic Blue Marlin, Makaira nigricans, was washed ashore dead, this time at Porthcurno Bay, north coast of Cornwall. An early morning walk on a windy Freshwater East Beach, Pembrokeshire, SW Wales, produced a surprise discovery of a dead Atlantic Blue Marlin, Makaira nigricans, in water shallow enough for a collie dog to try and haul the large fish inshore. Discoverers John and Helen Swancott estimated the fish to be 2.4 metres long. This extraordinary find was the third record for the UK. One feature that distinguishes Marlin from Swordfish is the presence of a pair of long thin pelvic fins, when not in use the fish is made more streamlined by retracting them into a long groove in the middle of the belly. 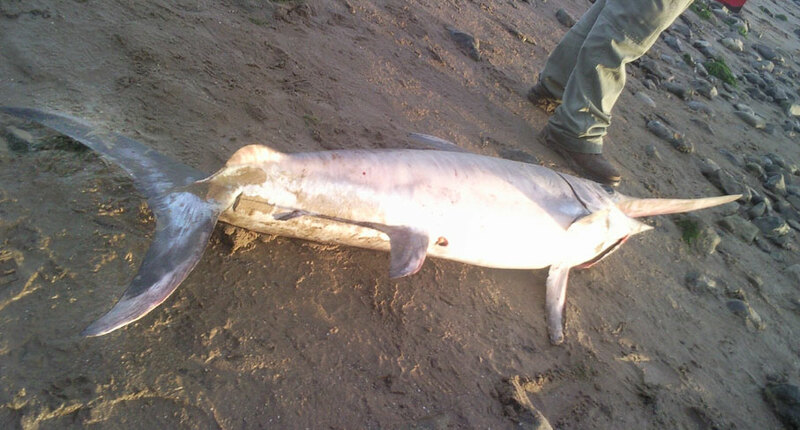 A Swordfish, Xiphias gladius, was washed up dying on Severn Beach at the mouth of the River Seven where the Bristol Channel narrows. It was two metres in length, including the long bill. 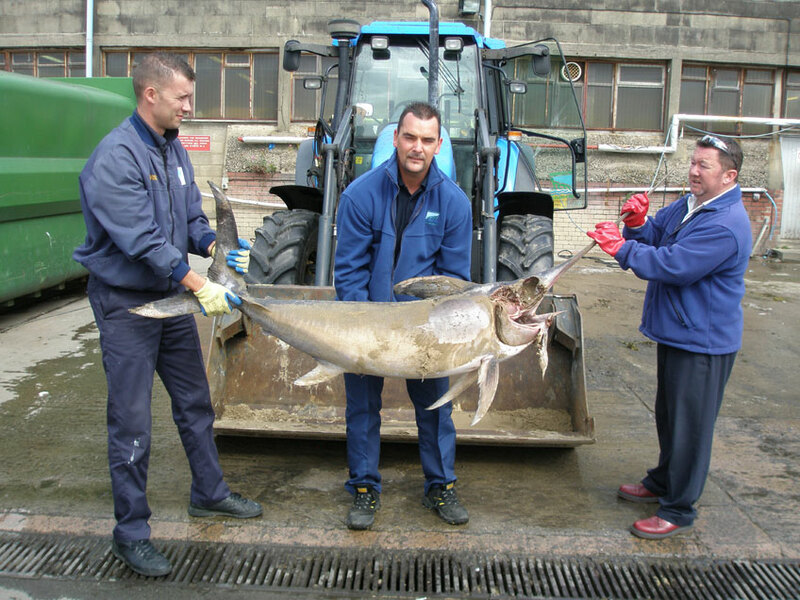 A Swordfish, Xiphias gladius, swam up the River Tyne and was caught in salmon nets close to South Tyneside. The oceanic fish measured 1.2 metres (4 ft) long from the tip of its sword to its tail. About 5:00 pm on the shore of Barry Island beach, Vale of Glamorgan, South Wales, a chap spotted a fin sticking out of the water and hauled in a dead Broad-billed Swordfish, Xiphias gladius, watched by a swarm of congregating gulls. A Broad-billed Swordfish, Xiphias gladius, was captured in trawl nets in the River Forth at Alloa, eastern Scotland, by fisherman Brian Hynd. The three metre long Swordfish had a sword of a metre in length. 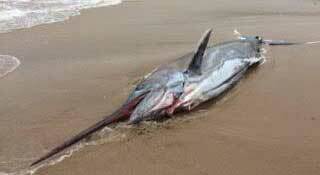 A Broad-billed Swordfish, Xiphias gladius, was discovered in the Kattegat, the shallow sea to the east of Denmark. It was alive but died shortly afterwards in only 50 cm of water at Oreby Port, three kilometers from the mouth of the fjord. "'Swordfish are seen occasionally in the North Sea in late summer, but it is unusual that it made so far into the inner Danish waters as Sakskøbing Fjord near Los Angeles. As far as I can see, it is not described before in literature," said Karsten Bjerrum Nielsen. Biologist Karsten Bjerrum Nielsen, the exhibition and distribution chief at Kattegat Center, believes that the catch was sensational. the fish was put on display at the Kattegat Center from 13 October 2009. They are often called a Broad-billed Swordfish, but there is only one species in the world. They are found throughout the tropical and temperate waters of the world but appear to prefer sea temperatures of 18°C to 22°C, migrating to cooler waters to feed in the summer. These oceanic fish chase herring and mackerel and are among the fastest fish reaching 90 km.h-1 (56 mph). This is in part due to their being warm-blooded, which allows not only their muscles but also their brain and eyes to work more efficiently. By 1998 the swordfish population of the North Atlantic was thought to have declined, due to overfishing, to only 35% of its original size. Once mature a female can produce 30 million eggs each year, giving the stock the capability of rapid recovery. However the females do not mature until they reach 70 kg, and the average size now landed is a mere 40 kg. When the population was first commercially targeted in the early nineteenth century the average fish landed weighed over 200 kg. Such a decline is a classic feature of overfishing. Drastic fisheries control measures are now in force for swordfish in the North West Atlantic, but is disputed as to how effective these have been and it is claimed that the stock is still at only half the level of a sustainable population. Peter Dent spotted a two metre long Broad-billed Swordfish, Xiphias gladius, (58 lb = 26 kg) thrashing about in his salmon net a mile off Newbiggin-by-the-Sea in Northumberland (north-east England). Because of its size and the damage it was causing the fish had to be killed. This is the first recent record of a Swordfish being caught off the British mainland coast, although there have been both sightings and Swordfish washed ashore dead this century. This fish was thought have to have been following the Mackerel shoals. Admidst so much excitement that the camera could be found immediately, a three metres long (including the sword) Broad-billed Swordfish, Xiphias gladius, swam past our dive boat off the south coast of Devon, off Teignmouth (near the wreck of the Galicia) on a warm sunny afternoon. In neither case above was the precise species of billfish identified, it is assumed from other confirmed records as the most likely species. Four Broad-billed Swordfishes, Xiphias gladius, (34 kg, 45 kg, 100 kg, 124 kg) were caught in nets set to catch Cod in shallow water (3 -5 metres depth) in Southern Öresund, south west Sweden. Another one was captured earlier, in September. The 34 kg Broad-billed Swordfish captured by the Swedish professional fisherman Gert Larsson. Swordfishes are an oceanic fish supporting a small fishery in the stormy mid-Atlantic Ocean. They are rarely found inshore and records of this fish from around the British coast are very rare. A Swordfish has been reported stranded on the Causeway to Worms Head, near Rhossilhi Beach, Gower peninsular in south Wales. It lived for one hour. NB: this report has not been confirmed. The swordfish very occasionally reported in British seas is the Broad-billed Swordfish, Xiphias gladius. The Grimsby Evening Telegraph reported a 3 metre long (including the sword) Broad-billed Swordfish, Xiphias gladius, discovered by Ian and Graham Royle washed up dead on Chapel St. Leonards beach, Lincolnshire on the east coast of England. This is usually an oceanic fish with just a few reports in British seas, one or two sightings in the English Channel of this fast swimming fish jumping out of the sea, and one report of a fish washed on the west coast of Scotland. 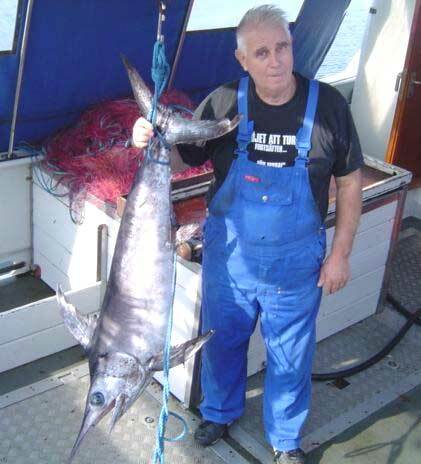 Guernsey Sea Fisheries Officer Roger Sendall while on board the French trawler, Melisandre witnessed the landing of a 1.7 metre long Swordfish, Xiphias gladius, weighing about 15 kg. The trawler hauled back its gear at 49 degrees 30.139 minutes N and 2 degrees 56.051 minutes West, which is about 11 nautical miles North-West of Pleinmont Point, Guernsey. I received a call this evening from Len Le Page who is the angling correspondent for The Guernsey Press newspaper. He told me that a party of anglers on an angling charter boat saw two 'billfish' off the South-East tip of Guernsey two days ago. (He said the 'billfish' were seen near the Lower Heads buoy. This is south of Jethou and Herm Island where the Little Russel and the Big Russel meet (49 ° 25.9 minutes North, 2 ° 28.5 minutes West). He told me on the phone that they thought they were marlin. I told him this was very doubtful. I said that perhaps they could be swordfish, Xiphias gladius. According to Len the surface water temperature is 15 ° C off Guernsey at the moment. The anglers on the charter boat said that they saw two 'billfish' jumping out of the water (unusual behaviour for swordfish?). Anyway, Len Le Page will write about their observations in his next column in the newspaper. I would like to know your thoughts about this observation. Have any swordfish been caught in the Western Channel recently? Have there been any other sightings? 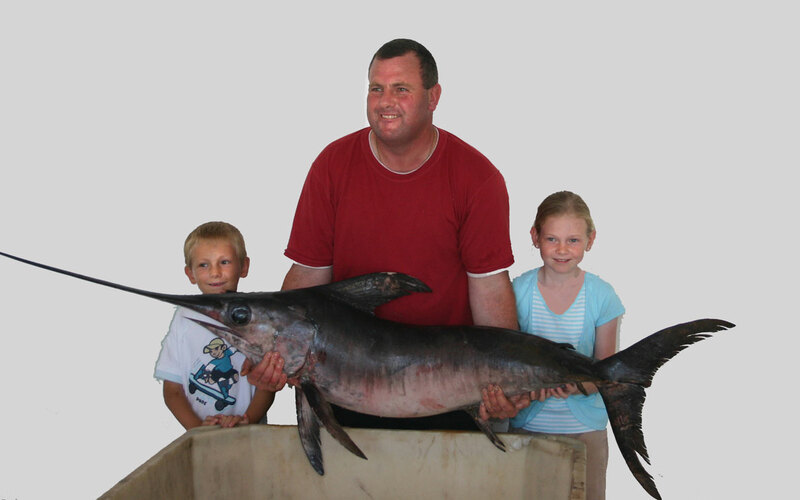 Thank you for your interesting letter about swordfish and white marlin. I am forwarding it to the Guernsey Press angling correspondent, Len Le Page, who wrote about the billfish sighting in yesterday's paper. He doesn't have an email address so I am printing your letter out and dropping it through his mail box. Your letter will be of great interest to him. Len wrote the following as part of his weekly column, which was published in the Guernsey Press on June 28, 2000. "Swordfish in local waters? Sounds stupid, but perhaps it's true. Anglers out with Brian Blondel near the Lower Heads were startled when two fish started to leap clear of the water near the boat. They stayed close by for a number of minutes, performing acrobatics on three or four occasions. They were quite large, the biggest was possibly six-foot long, and each had a long spear-like snout. Initially they were considered to be marlin, but after a number of fish identification and marine biology publications had been consulted it seems much more likely they were swordfish. There were a number of reasons why this conclusion was reached. One is the usual distribution of the two species. Marlin are extremely rare in northern European waters, with only one or two being recorded over the year. They are a tropical fish and it is very unlikely that they would have strayed into our waters while the sea temperature is still as low as it is at present. On the other hand, swordfish are known to move into much more northerly latitudes, are much more common and have been seen as far north as Iceland and Norway. The second was the colour. All the witnesses agreed that the backs of the fish were dark brown, which agrees with the description of the species in the identification books. The third reason was the swordfish's main diet, which is herring and mackerel. These species have been abundant on the Great Bank in recent weeks, which may well go some way to explaining the swordfishes presence in the area. Although it would appear that the identification was quite conclusive, some doubts remain. 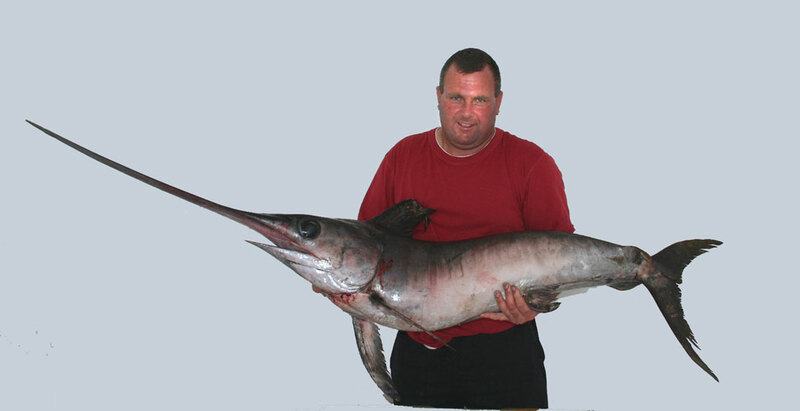 One of our commercial fishermen has fished for marlin and swordfish in foreign climes. In his experience swordfish never tail walk and leap clear of the water like the fish seen here. On the other hand it is a common occurrence as far as marlin is concerned. Regarding, tuna and bonito sightings in Guernsey waters.. I have not heard of any in five years of living here but I keep hoping. You write that you have spent considerably amounts of money fishing for swordfish. I worked for 12 years at Fulton Fish Market in New York. There I regularly saw carcasses over 800 lb.. Many of these massive fish came from Chile. A book recently published that I recommend is "The Hungry Ocean" by Linda Greenlaw. Linda was a captain of a swordfish longliner that fished out of Gloucester, Massachusetts. Her book is all about fishing and slaughtering swordfish 1000 miles to the East of her home port. It makes for compelling reading. Linda was mentioned in the book " The Perfect Storm" by Sebastian Junger. Linda's boat, Hannah Boden, was the sister ship to the Andrea Gail, which sank with all hands and was the main subject of "The Perfect Storm." If you want to catch swordfish it makes more sense to fish the higher latitudes where the bigger beasts congregate. By the way, The Hungry Ocean was published in 1999 by Hodder and Stoughton, ISBN 0340 72896 5 (paperback). Linda gives a lot of detail about how to catch swordfish in her book using squid, coloured dye and glowing light sticks. to catch these magnificent gamefish in warmer waters, and even when studying here, crafting lures in expectation of my next fishing trip. My guess is that the billfish sighted were either white marlin (Tetrapturus albidus) or broadbill swordfish as you mention. These two species are the most cool water tolerant of the Atlantic billfish. 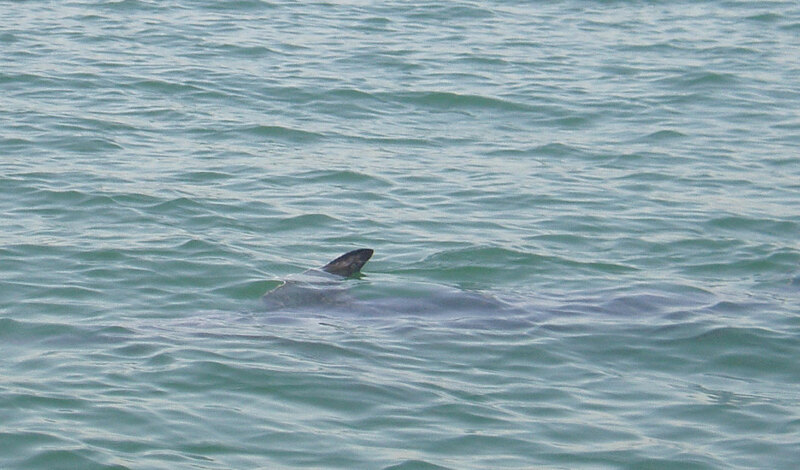 Both species are inclined to fin and cruise on the surface in cooler water to bask in the sun, possibly to regain body temperatures after hunting in the depths. Swordfish are the billfish one would expect to see in British waters; however, white marlin are also quite cold water tolerant. There is a very prolific rod and reel sport fishery for these fish in Portugal and it's possible they could stray north to British waters. Although the surface water temperatures would appear to be too cool for them at 15 ° there may have been a warm eddy or similar area of warmer water coming up from Biscay that's bringing them with it. Billfish have the ability to maintain their body temperature higher than the surrounding water temperature (i.e.. warm blooded) and are well adapted for crossing through thermal fronts and changes in pursuit of baitfish for which these thermal changes seem to act as a barrier. rounded dorsal and pectoral fins, although this is unlikely to have been noticed in a distant free jumper. Hope this helps somewhat in confirming the identity of these two glamorous visitors, and that Guernsey will see more billfish and tuna in the season ahead. It'd certainly make a pleasant change from cranking up cod! ps. I'd be very grateful if you could kindly pass on any records of tuna or bonito sightings in the Channel Islands area. A large 180 kg (400 lb) Swordfish, Xiphias gladius, was caught off the Cornish coast and put on display at Brighton. These large fish are extremely rare off the British coast. One was seen off the Isle of Wight a few years ago. (this specimen may actually have been caught further afield, e.g. Biscay, and brought in by the Newlyn, Cornwall, boats). 15 August 1997. A very interesting and the first discovery of a Broadbilled Swordfish in the Inner Clyde. This fish was washed up dead on the shore of Loch Long, and measured 3.3 metres (8 ft 10") with a girth of 107 cm (42") and the weight was estimated at between 113 kg and 136 kg (250-300 lb). The scientific name is Xiphias gladius. A 1000 lb Swordfish was landed at Newlyn Fish Market during the week. Reported as being the largest specimen ever landed there. A Fishing Boat landed its catch at Newlyn Market of Long Fin Tunny mostly about a stone in weight, but a few nearly twice that size. Estimated catch 3500 fish, also in the catch were Black Bream, Bass and an eight stone Mako Shark with a baby one only two ft long. There were also about a dozen large Swordfish, 9ft long, plus 4 to 5ft sword and many smaller Swordfish.